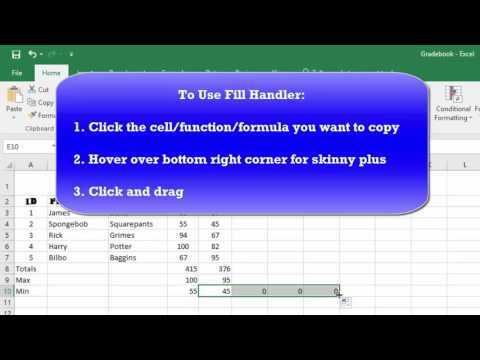 Work along with the Excel Functions & Charts video tutorial, to add functions and a chart to your Gradebook. What is the difference between a function and formula in Excel? Which is NOT a function? When I use a function in Excel (like AutoSum), what's the first step? is an example of a range of cells. I can only use the range that Excel gives me. You should include totals any time you do a function like Max/Min/Avg. The copies functions or formulas from cell to cell so that I don't have to redo my functions every time. How do I know I am using the fill handler? Where do I find the fill handler if I want to copy functions/formulas from cell to cell? Just like in Word, I can apply Styles to my cells in Excel. Where do you go to format numbers in Excel with things like $ , or %? Which edits can I do to my Excel Sheet? To change the name/color of an Excel sheet, I . Which is NOT true about inserting a chart into Excel? You should try to position your charts/graphs . A chart cannot be resized/moved once it's put into a worksheet. Which is a tab under Chart Tools? Why would a chart appear blank in Excel?